Full function in case of condensation: dew-point resistant! The tower oscillation monitor GEL 3010 is designed for monitoring oscillations and vibration on machines and installations "in accordance with DIN ISO 10816". MEMS acceleration sensors, safety relay and EtherCAT or CANopen interface are integrated into a compact housing made of anodised aluminium. The state of the vibration monitor can be checked on-site using 6 diagnostics LEDs. The tower oscillation monitor contains a positively driven switched output that can be integrated into an existing safety chain. A redundant system can be realised by using two tower oscillation monitors. The GEL 3010 is suitable for standard and heavy-duty applications, it also withstands aggressive media and impresses with a long, maintenance-free service life. It can be used in an expanded temperature range from -40 ºC to +85 ºC. 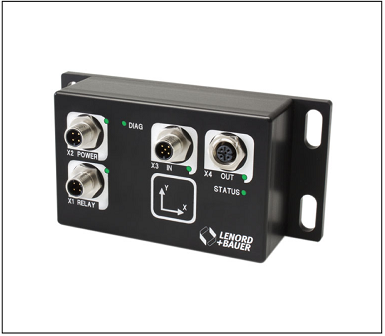 The tower oscillation monitor is available with an EtherCAT interface or a CANopen interface. 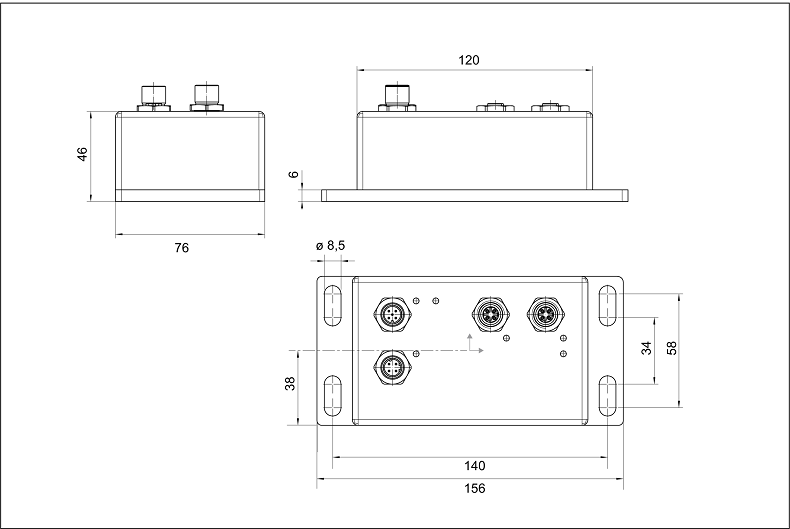 The switched output is a positively driven, floating safety relay with one normally closed contact and one normally open contact. In the de-energised state and in case of an error, the relay is open. The switching points (trigger limits) and the trigger delay are adjustable. The tower oscillation monitor GEL 3010 measures the accelerations in the X and Y direction using so-called MEMS acceleration sensors, micro-electro-mechanical systems that operate like spring-mass systems. In principle a freely moving mass is suspended in the MEMS module; this mass is held in the middle position between two reference electrodes by springs. The mass forms the moving electrode of two capacitors. The moving mass is accelerated by oscillations and vibration. It moves and the distance between the middle electrode and the reference electrodes changes, as a consequence the electrical capacitance of the capacitors also changes. The electronics measure this change in the capacitance and compare the values measured with the limits set. If the acceleration reduces, the springs return the moving mass to its original position. If the acceleration is zero, the installation has reached the required speed or it is not in operation, as a result the spring-mass system is at rest. The GEL 3010 contains two acceleration sensors that measure the movement in both the X and Y direction. This configuration makes it possible to test the sensors internally during the self-test. After power up the GEL 3010 checks the internal acceleration sensors and the relay during the self-test. Once the device is ready for operation, the status is sent to the installation control system via the bus interface. The continuous self-test function in the GEL 3010 ensures both acceleration sensors are tested during operation. A defective sensor is reliably detected and the device signals the failure of the sensor via the field bus. During operation a self-test can be triggered by the installation control system using the field bus protocol. For this purpose the relay is switched once, as a result the safety circuit is opened. To ensure an interruption-free safety circuit even during the self-test, two tower oscillation monitors should be connected in parallel. In this case the self-test triggered via the field bus must not be initiated on both devices simultaneously. The GEL 3010 can be permanently wired in series with other monitoring devices in the safety chain. If a monitoring device triggers, the safety chain is interrupted and, if necessary, emergency braking initiated. On reaching the limit set, the safety relay in the tower oscillation monitor can be switched and the safety chain opened. In parallel the critical state is signalled to the installation control system via the field bus. In this way dangerous, superimposed resonances are reliably detected and the installation shut down. Customer-specific modifications to mechanical and electrical features are in principle possible.